We live in the Age of Recycle Culture. We live in times of poverty when it comes to cultural life. For more than two decades we have been mostly looking backwards. In recent years we have even cultivated looking backwards in something commercial and trendy. This to make people feel good and even to give them the feeling they are actually helping to flourish our cultural output and life. The point is that most people have no real knowledge of culture and no real cultural background. They only have as a reference what is today commercially exploited. Which is dominated by backwards looking emptiness. Most people do not know the artists who were groundbreaking and truly original. This makes it easy to make people believe that something of nothingness is of value and let them misinterpret contemporary cultural life as original and authentic. This is evident everywhere. The most used and exploited words when it comes to cultural life are since years “vintage” and “retro”. Vintage simply means old, while retro means doing it over. Both words very clearly indicate a backwards looking attitude. Another word a little less used and slightly better is “neo”. I used this word in an earlier phase for some productions. But in the end neo means doing it again in a new way. Which also indicates a backwards orientated attitude. It is very easy to get stuck in this backwards looking way of living and creating. And for sure it is much easier than trying to go beyond this. In our age it is extremely hard to come up with something truly original. I am not claiming I am. But I claim that at least I am trying. The way to move onwards is creating a sense and setting of going beyond. When employing this attitude the word “post” is what we need. While the words vintage, retro and neo are all related to time, the word post is related to content. Like it was used by the Post-modernist movement. It indicated not a movement after Modernism, but it indicated content which was beyond that of modernist artists. 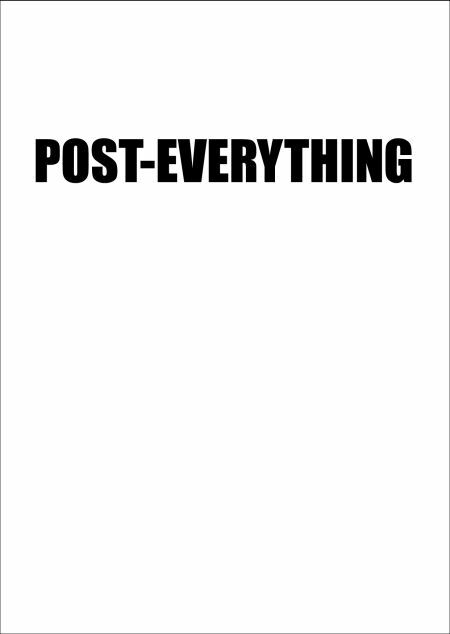 We have to go beyond the current backwards looking trend and attitude and be “post-everything”. Even only as way to try to start creating new meaningful and daring cultural output.